A trio of wide releases reaches theaters this week, all with prominent pedigrees and high hopes for box-office gold. One of the three will certainly unseat Training Day as the number one film this weekend. My pick for this crown is Fox's From Hell, launching in 2,305 venues. 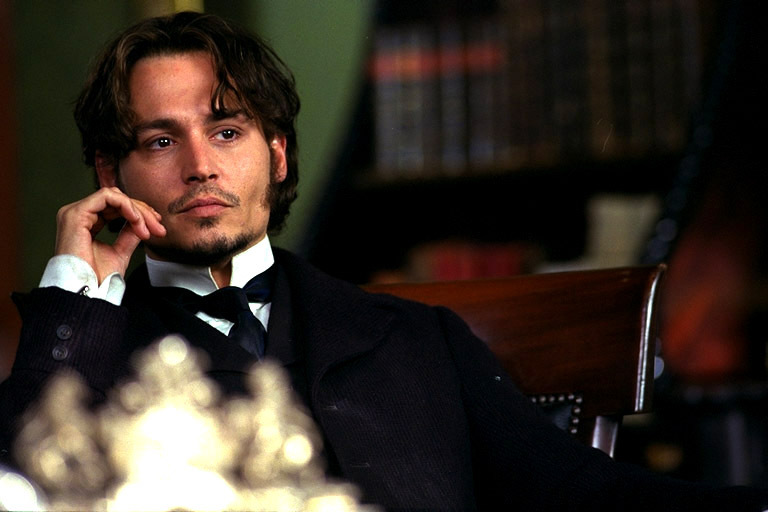 Johnny Depp has been something of an inconsistent box-office draw, with hits like Sleepy Hollow and respectable showings such as Blow residing amid failures such as The Astronaut's Wife. However, his successes have tended to come in movies with a strong cultural hook, as with the aforementioned Sleepy Hollow. The story of Jack the Ripper certainly fits this bill, and the advertising for the film is, not coincidentally, reminiscent of Sleepy Hollow's, focusing on grisly imagery and hitting the possible romance angle between Depp and Graham. Continuing the comparison, in the great Hollywood box-office equation, Heather Graham > Christina Ricci but the Hughes Brothers < Tim Burton. Depp also plays a police inspector with a special insight into the case in question in both films, a happy circumstance, I'm sure. Sleepy Hollow took in $30.06 million in November of 1999, but also had a much wider release with 3,062 venues. From Hell ought to split the difference between Hollow and Depp's last film, Blow, taking in approximately $20 million for the weekend. The film with the most schizophrenic advertising campaign so far is The Last Castle. What originally had been promoted as a tense character-driven drama, pitting Robert Redford against James Gandolfini, has morphed into something resembling a cross between The Rock and Courage Under Fire, with nearly no mention of the two top names. Normally, a major shift in tone is a very bad sign for a film this close to release, since it means that they're having trouble connecting with the potential audience, but this time I think it's more a case where they found a better angle. Ads have also shown up recently proclaiming "no one takes our flag," in reference to the flag over the military prison of the film, but also trying to appeal (some would call it pandering) to the surge in nationalistic sentiment after the incidents of September 11th. It's difficult to gauge exactly how much this kind of advertising will help the movie, as desire has to be there in the first place, but even though it doesn't sit quite right with me, it will certainly not hurt the film's chances this weekend. Redford emerges from a seeming semi-retirement from acting this year, with Spy Game also coming out in November. His previous film, The Horse Whisperer, opened to $13 million in 1998, although that was based on a popular book and reached out to Redford's significant female audience. James Gandolfini brings name recognition from The Sopranos, but I have a hard time imagining a great bulk of people heading out to see a movie just because James Gandolfini is in it (at least not yet, anyway). At 2,262 venues this weekend, The Last Castle should do respectably well, bringing in around $15-16 million. The widest new release this weekend is Drew Barrymore's long-windedly titled Riding in Cars with Boys, with 2,770 venues. Drew once again is playing her cute-but-awkward- and-eventually-strong-cause-just-she's-got-to-be-and-did-I-mention-she's-cute character, but this time in the '60s. Rightly or wrongly, the ads give me a similar feel to Girl, Interrupted, which opened to $8 million on 1,337 venues in January of 2000. Despite its low-key subject matter, it is getting a heavy push in TV ads, even if at the same time it feels like it should be premiering on the Oxygen Network. Directed by the other half of the evil Marshall siblings (Penny), this should be able to capitalize somewhat on its wide opening and favorable press (so I've heard, anyway) to at least break double digits. Last week's number one film, Training Day, likely falls to fourth this weekend, bumped by all three new releases. However, it has already taken in a healthy $47 million as of October 17th. The 41% drop of last weekend should cool somewhat to the mid-30s, placing this weekend's take in the $8 million range. Bandits, despite nearly pulling off an upset last weekend and finishing just shy of number one, will fall off sharply, as few if any kind words can be found about it aside from, "I didn't hate it", or "It could have worked." The most interesting film opening this weekend in limited release is Waking Life, the latest from Richard Linklater of Dazed & Confused fame. Although only in four theaters, this has the best hook of any of the films in limited showings this weekend, as it was filmed in digital video and then rotoscoped to turn it into an animated film. Although unlikely to make many waves at the box office -despite the animation, it's mostly talking - due to this year's addition of a long-format animated film category this year at the Oscars, expect to see this one battling against the mighty likes of Shrek and Monsters, Inc. for the award.